We've done polls in Massachusetts and Minnesota over the last couple weeks and found that Mitt Romney, Tim Pawlenty, and Michele Bachmann are all unpopular in their home states. That's par for the course with this GOP Presidential field- we've polled on 9 of the candidates or potential candidates in their home states and only one of them is well liked- Gary Johnson in New Mexico. That's probably not a good sign for any of these candidates. If the voters who know them best don't care for them, why would others around the country? Certainly you don't have to be popular in your home state to get elected President but it would be a good sign if you were. I wonder what Ron Paul's favorability is in Texas. Any numbers? Could you check Huntsman's popularity in Utah in the near future? I imagine him still being quite popular over there, but I have no idea to what extent. It is possible to win the Presidency without winning one's "own" state -- as Al Gore came close to doing in 2000. I am not surprised that Mitt Romney fares badly in Massachusetts and that Tim Pawlenty fares badly in Minnesota; they became Governors when conservative 'solutions' suddenly became popular. Such solutions, when put into practice, have faded in attractiveness in liberal-leaning states. Rick Perry? Maybe Texans are getting tired of him. That happens over time. It's a bit ridiculous to exclude Ron Paul considering that the latest poll I've seen shows him with a 79% favorability rating. With nothing interesting going on there, doubtful we'll be polling Utah. LOL! I can tell your polls are bogus because it's not possible for Rick Perry to have a -8 rating in Texas UNLESS YOUR SAMPLING IS WAY OFF. This is to manipulate public opinion. Of course you do know how to sample correctly but only when election time comes around to obtain more accurate results to acheive an acceptable reputation. Ron Paul's approval rating in his district was 84% approving of his job and 79% favorability (not a real word) according to a Moore Information survey conducted for Paul’s campaign in February 2010. I doubt it's strayed far, but obviously this poll doesn't see fit to include him so I thought I'd undumb these results with a comment. A Republican candidate that can't win his home Republican state is a problem. A Republican candidate that can win his home Democrat state is a solution. Interesting poll. Also interesting that Ron Paul is continually left out of mainstream media polls...I mentioned that this morning on my blog. I'm from Texas and don't like Perry. So I wouldn't say it's too far off as most I've talked to lean slightly more toward not liking him. He got re-elected as the better of two options. That is just my opinion though and should be taken as just that, opinion. @Stephen - I'd be interested to see statewide polling data for Dr. Paul as well. As far as your stats go, one district does not a state make, but neither does one decision a Presidency make(Obama and OBL's death). "A Republican candidate that can win his home Democrat state is a solution." There isn't one of those. The closest might be Romney in his second-home New Hampshire; he was one point behind Obama when we last polled that state. Why was Perry polled over Paul? I am sorry if I come off as another annoying Paul supporter, but Perry polls at around 5% at best whereas Paul is much higher and is actually announced. Johnson not only won election in N.M. he won re-election. As this shows he is still popular there, which can not be said of the others. BTW, Have you polled Johnson vs Obama in N.M. I would be interested to see the results after seeing this poll. "BTW, Have you polled Johnson vs Obama in N.M. I would be interested to see the results after seeing this poll." All of these numbers come from polls taken earlier this year. In early Feb., Obama was beating Johnson, 51-36, but that's better than any of the other Republicans did. Romney was down 16, Huckabee 19, Gingrich 21, and Palin 29. I guess that means he has at least some crossover support there. Also not bad for a 2:1 Dem state getting a better than 1.5:1 vote. Closer to the Primary there and depending on how the economy fairs there, he could do rather well considering the other 13% undecided and polling margin of error. I think if Johnson get the nomination. N.M. may come into play as a toss up. However, with only 5 electoral votes, I doubt that would make a big difference. I'd also like to see how he fairs in a large liberal state like CA once his name recognition gets up more and with the economic/budget issues it's having. Being able to take a state like that(55 electoral votes) would give him a serious shot at beating Obama in the general. Of course that is all speculative. Thank you for posting the N.M. Data for me even if it's 4 months old. I think it's obvious why Dr. Paul was excluded - his numbers would defeat the thesis. The poll report title is intended to create public perception that the Republican field has nobody in it that can win. Dr. Paul's numbers defeat the thesis, so they were omitted. I wonder if PPP actually polled for him and left them out or decided not to poll for him based on the general knowledge of his high approval rating at home. He's a real contender by the vast majority of straw and telephone polls - certainly rating much higher than some of the candidates included here - so that can't be the reason for the omission. PPP can go ahead and prove me wrong, though (but I expect this comment will just get deleted since they seem to want to shape opinion). "I think if Johnson get the nomination. N.M. may come into play as a toss up. However, with only 5 electoral votes, I doubt that would make a big difference." That's a lot of "if"s in your scenario. If he did make NM competitive, which is still not likely, he'd be a worse candidate than other Republicans elsewhere. Not a lot of "if's" just one big one. However, he has overcome that one on a state level before. With Rick Perry now likely to enter the race, I'm curious as what a Texas GOP nomination poll will say especially if it's just Perry vs Paul. Texas would be the only state with to home-field advantage candidates wouldn't it? I will concede that he would have problems in the more conservative parts of the South than other Republicans. However, with Republican heavy South, the question becomes can they over-look the social issues in order to defeat Obama? gary johnson and rick perry are included in the poll, but not ron paul. umm.. weird. Governor Johnson was a Republican governor that won over his Democratic state not once but twice. That is the point Kreationz was trying to make. Who's in charge here? There's a man named Ron Paul. Heard of him? He's running for President. Rick perry is not running for president. Have you considered including Ron Paul? Hello? Anyone home? McFly? Why did you exclude Ron Paul from this poll? Hello? Anyone Home? McFly? Ron Paul is an official presidential candidate. Who's in charge here? Correction: An earlier version of this article listed incorrect favorable and job approval ratings in Paul's internal polling. Paul is wildly popular in his district, but not necessarily Texas overall. Huntsman is a mixed bag. A lot of us in Utah despise him, but he has his fans. He's Mormon, so it helps here. "Texas would be the only state with to home-field advantage candidates wouldn't it?" And you had a lot of "if"s--IF the economy fails, IF Johnson gets better known, IF he even runs and stays through the primaries, etc., etc. Anyone got a link to the actual polls involved?? When I said "one big one", there was several smaller ones mixed in to it. The "big one" is if he gets the nomination, which I'm confident as he overcomes the smaller "if's" he will. He had to do all that to go from an unknown to get the GOP nod for Governor. Only time will tell if he can do it again to get the GOP nod for President. He's overcome a lot of obstacles in his life. And me, I'm a supporter and I know I'll be doing everything I can to try to make that happen. Why would you poll Gary Johnson who isn't registering nationally and not one of the frontrunners in Ron Paul? Oh come on. I'd love to see these numbers for Ron Paul. Either oversight or blatant. What kind of joke of a polling organization includes Sarah Palin who isn't even running, but not Ron Paul, who has been polling in the top 5 candidates since the get go? How stupid do you think voters are? Ron Paul won his last congressional race with a 70% thrashing of his Dem opponent. That is the purest form of approval rating one can get. I like Gary Johnson; but I am not an idiot. Ron Paul is the most experienced electioneer in the mix. 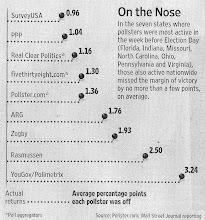 Next time you write a piece (quote polling results) do it accurately and completely. There are plenty of us who have IQs higher than room temperature. Quit assuming we don't. Once again, Ron Paul gets no mention. Why bother posting the results of a poll if your not going to actually include the real results? Clearly, clearly, clearly Ron Paul was left out of this poll so that the author could promote his version of reality. This is plain and simple intellectual dishonesty. I'm growing very weary of people stating the facts that fit with their agenda. Politicians lie and and political writers lie. No wonder our county is what it is instead of what it could and should be. No doubt Ron is popular in his district, but I'd like to see some statewide numbers as well for him. Why does he continually run for Rep. when a senate seat hold's more power? I thought he should have made the switch a long while back. Being from Texas he would have had my vote for that. I'm not from his district however. I like Johnson. I also like Ron Paul, and worked for him in 2008. It is telling that out of all the candidates, Paul's numbers were left out of this comparison. I suspect that 's because he probably polls close to Johnson in New Mexico.